This is one of those weeks where I'm watching everything that is coming out. I love those weeks. Last night I saw the slightly bizarre Restless (which would have been better if I wasn't so sleepy) and my beloved War Horse. BTW, since our shop somehow didn't get War Horse posters shipped to us, if someone comes across one, pleeeeeeeeeease send me one! Like, the big posters. Please please please? 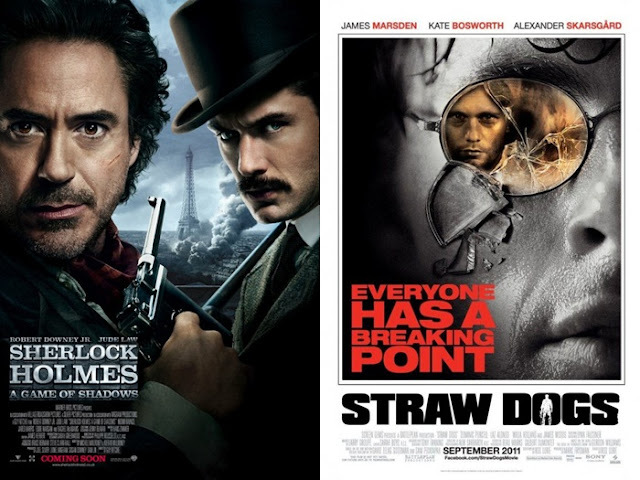 Anyway, I'm watching Straw Dogs tonight, just because I love Alexander Skarsgard (I haven't seen the original, though, but I'll do that), and also Sherlock Holmes: A Game of Shadows, since it is the biggest release of this week. And yeah, I'll be all watched out by the end of tonight. Just because I'm in love with Tom Hiddleston at the moment. Between this and watching Midnight in Paris, The Avengers and War Horse within a week of each other, I've become more certain that Hiddles is the awesomest person on this earth. Plus, he had the exact same reaction to Warrior as me. As you may have noticed, the sidebar has been tinkered with a bit (but I'm pretty sure it looks horrible on any browser that isn't Google Chrome). You'll find buttons that lead you to each of the features, my obsessions, the blog of the month, and my most anticipated for 2012. The other new feature on the sidebar is '5 films to check out in May', which happen to be Me and Orson Welles, Red Riding trilogy, Strange Days, Sunrise: A Song of Two Humans and Tyrannosaur. No, these movies have nothing in common. These are just random recommendations of films you probably haven't seen, and May is the time when you should give them a watch. You don't have to, but if you do, let me know. Also, let me know what you think of the revamped sidebar. Speaking of May being a month to watch a certain of selection of movies, Tyler has announced that he'll be watching a whole lot of classic movies. It has been over a year since my classic movie marathon, I need to get some more in my life. Alex wonders why there aren't any female cinematographers. Why is that? Nikhat gives some love to the incredibly awesome In Bruges. Mette embraces some filmic poetry. I hate poetry, but they're a fun way to write reviews of movies. Accompanying my ICT period today was Reel Insight's podcast episode about Scarlett Johansson. They also plugged me at the beginning of the episode, so thanks a million for that! Andy starts his female film director focus on Sofia Coppola's brilliant The Virgin Suicides. Hiddles is amazing. Also loving the sidebar. Fav female director- Sofia Coppola *obviously*. I also really liked Miranda July. Sofia Coppola's my favourite, too. Love her! To switch dramatically to a downer, it's sacrilege to watch the Straw Dogs remake before the original. Granted, I haven't seen the original but there is no way they can make another version anywhere near as good as Peckinpah's. Bloody love that film. I am going to watch the original Straw Dogs, I just ran out of time since I completely forgot the new one was coming out. I had to get it now since it is an R18 so I needed my sister to get it for me. It wasn't that great, though. Is that because of Dolly? Awwwwwww. Sunrise is such a lovely film, I hope more people will watch it! Thanks! And yes, Sunrise is lovely! My favorite female director is either Andrea Arnold or Lois Weber. I do love Andrea Arnold! I am going to check out her work! I'll recommend Varda's 1962 film Cleo from 5 to 7. A classic film of the French New Wave, and a quite accessible one. Cleo from 5 to 7 is a great film, definitely worth checking out Stevee, you'd really like it. Hum, well, I think Leni Riefenstahl is a really good female director but obviously her films are complicated. She's probably the best, of those I've seen, but I'd probably pick Claire Denis as a favorite right now. She's made some beautiful, elegant films. Friday Night and Chocolat are stellar films. I would like to check out some of Riefenstahl's work...where should I begin? And I will check out those ones, too! I would rather watch the original Straw Dogs than the re-make. It's just that the original is truly visceral and it has this extremely tense direction from Sam Peckinpah. I don't know why they wanted to do a remake of Straw Dog. It's just seems like a waste of time because you just can't remake a film by Sam Peckinpah. A Peckinpah film, no matter how violent or crazy as it is, just leaves a lasting impression for the way human behavior is explored. I will see the original...but the remake was pretty bad. American Psycho was amazing. And yes, she barely ever does stuff. Which is a shame, but it is good to be picky! Hope you like Game of Shadows. I thought it was better than the first Sherlock movie. Almost every time when I come here, your sidebar gets awesomer. I think you're a strong contender for Design Lammy. Favorite female director is Sofia Coppola, but it also makes me realize that Coppola is probably the only one female director whose works I've seen. Meaning not one film, but more. Sad. And I'm just about the same. I've seen a lot of work from different female directors but I haven't really focused on any of their careers like I have with Coppola. I should change that! Thank you SO MUCH Stevee for the two links. Glad you enjoyed my Female Cinematographers post! You're welcome! That post was really awesome!